This grapevine Christmas wreath is a fun holiday project. 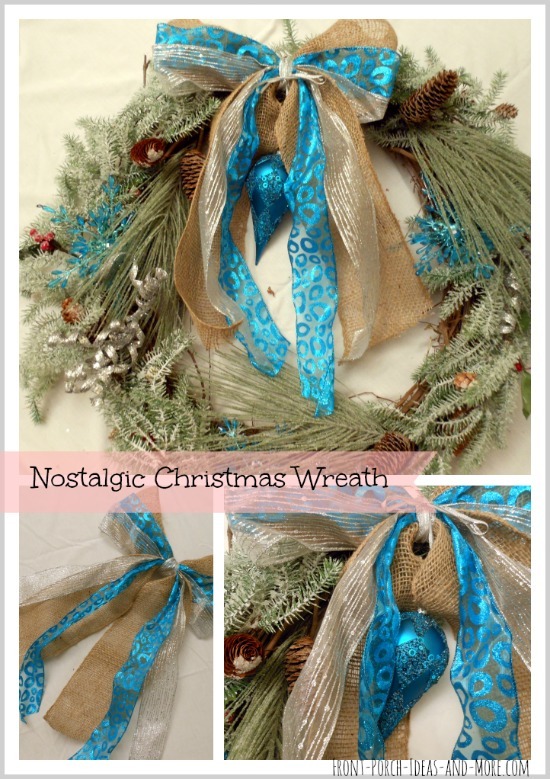 I just made this nostalgic Christmas wreath in blue and silver for our front door. It was easy. It's more a matter of gathering up pretty materials than it is technique. So come along and see how I made this. I am very happy with the result; it has a little bit of vintage attitude! A grapevine wreath (not shown); any size is fine but we chose one on the larger side. I placed the frosted garland onto the grapevine wreath. It fit almost perfectly. I attached it with floral wire in several places. Now I will add the evergreen picks to the wreath. If you look closely, you can see that I tucked the evergreen picks onto the wreath. They give it an overall wispy look. Next, I tucked in the aqua snowflakes and the silver squiggly ornaments. I only wanted a hint of them to show so I tucked them underneath the evergreen picks so that they show just a smidgen for sparkle and color. Close-up of the aqua snowflake and squiggly silver ornaments tucked beneath the evergreen pick. I tied a simple bow using burlap, aqua and silver ribbon. I attached the bow to the wreath with floral wire. Usually I put bows on the sides of the wreath but this one I decided to center at the top of the wreath. Lastly, I added the pretty vintage Christmas bulb to the bow with just a skinny piece of silver ribbon that I tied in a bow. I like this finishing touch. Here is a close-up of the ornament tied to the bow with a strand of silver ribbon. We found the sparkly garland at Home Goods and made the cute hanging balls in the transom window from leftover blue ornaments we had. Do you see our Christmas mailbox? We made that, too, and here is the free mailbox tutorial.